Eden Rock Country Club is a grand New England institution, a lush haven of leisure and cocktails, where gossip and intrigue lurk discreetly behind a veil of old-world propriety. But one Fourth of July, a flock of geese descends on the club’s manicured lawns; never fond of outsiders, the Eden Rock denizens find these new guests distinctly unwelcome. When Charles Lambert, a bond trader with a strong portfolio but a weak golf game, accidentally kills a goose with a wayward drive, he sets in motion a series of events that will leave the club and its members changed forever. His wife, Madeline, must face the mutterings of other members about the state of her marriage–and his sanity. 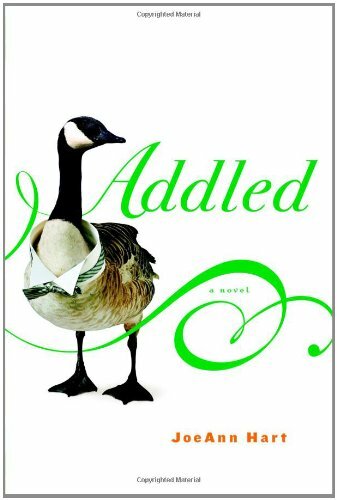 Meanwhile, their daughter, an animal rights activist, mounts a quixotic campaign to make the club go vegan, much to the annoyance of Vita, a talented, obsessive chef who has her own plans for the geese. Hart’s debut sardonically exposes the inner lives of the members of New England’s prestigious Eden Rock Country Club. Bond trader Charles Lambert’s botched tee-off accidentally kills a goose that’s part of a huge flock that has invaded the club’s grounds, spurring him to eccentrically “examine the balance sheet of his soul.” The other members think he’s lost his mind, forcing his wife, Madeline, still out of her depth with Eden Rock’s old money, to deal with the gossip and cross looks, while their animal rights activist daughter protests the club, insisting it go vegan. Meanwhile, the club’s chef, Vita, is secretly fattening up a portion of the flock with the illicit intention of creating an unforgettable meal for club members. The damage-controlling club manager, Gerard Wilton, the dieting Dr. Frank Nicastro and the secret-mongering dowager Arietta Wingate round out the cast. While some of the lesser characters tiptoe dangerously close to stereotypes of the rich and privileged, Hart does an admirable job of developing memorable flawed characters and letting them loose in an absurd situation. The misunderstandings, unusual pairings and comic antics call to mind the twists and turns of an old-fashioned drawing room comedy. (May) Copyright © Reed Business Information, a division of Reed Elsevier Inc. All rights reserved. Out of an overly familiar setting and well-worn themes, first-novelist Hart fashions an inspired social comedy. Madeline Lambert is facing a challenging summer. Ever since her husband killed a goose with an errant golf shot at the Eden Rock Country Club, he has virtually abandoned the family. Sequestered in his garage while indulging in his new hobby, metal sculpting, Charles has morphed from a staid businessman into an unshaven, absent-minded philosopher. There’s also Madeline’s daughter, Phoebe, who is on a campaign to force the club to go vegan by staging an embarrassing series of demonstrations. Elsewhere at the club, the talented chef is eyeing the ubiquitous geese with culinary intentions, and the buttoned-down general manager finds his routine and his equilibrium upset by Phoebe’s passionate protests. With a delightfully wacky sense of humor and a subtle use of metaphor, Hart delivers a story of transformation. The lure of romance, rejuvenation at midlife, and the joys of creativity are all given their due in a first novel that is both very funny and very moving. —Joanne Wilkinson. Copyright © American Library Association. All rights reserved. Hart has written a wonderfully funny book that has many passages of writing that are as good as anything I have ever read. Style is sometimes a four letter word, but Hart does it credit. —Reviewed by Bob Williams Read the full review at The Compulsive Reader. Addled sings with carefully observed satirical wit and is pure, laugh-out-loud funny. Hart knows her subject as well as she knows her audience, and this accomplished debut makes for a perfect summer read. —Review by Kristy Kiernan Read the full review at Book Page.